So, this is my last full day off before I go back to work full time. It’s been three years since I’ve known I was going to get 40 hours a week and get a paycheck every week. The time off has been nice, but stressing over work hasn’t been all that fun. I’ve done alright picking up freelance and part time work, but that can be really stressful. I actually start my new job on Thursday but I have one more freelance gig tomorrow so J suggested going out for lunch today. We had to do some grocery shopping anyway, so I figured why not. I was planning on driving to a bar and doing the pub food thing like we usually do, but J said she wanted something “lighter.” There’s really not much in Kalamazoo that is “lighter.” I really wish there were more deli’s and sandwich shops that aren’t chains so we can have some variety instead of going to the same place whenever we’re in the mood for sandwiches. While there are chain sub shops on almost every corner in town, there is one chain that we’ve never been to. They actually have two locations in the Kalamazoo Metro. One is on Westnedge and Romence in Portage, but we chose the one on Stadium in Kalamazoo. 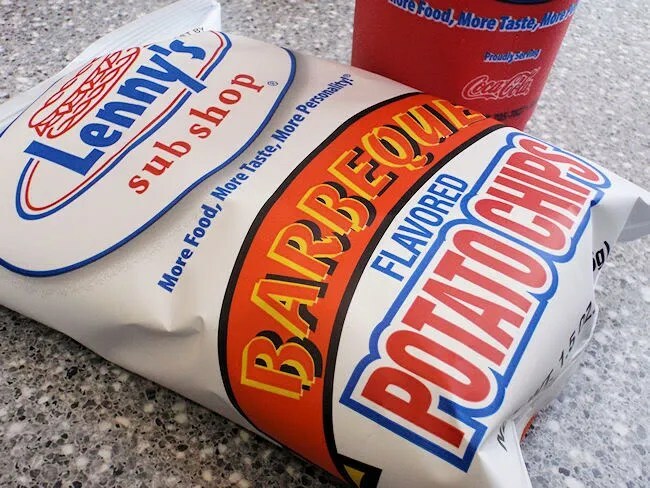 Lenny’s Sub Shop is billed as a Philadelphia-style sub shop that got its start in Tennessee. They have a couple hundred locations in twenty states including five locations in Michigan. The signature sandwich at Lenny’s is what they claim is an authentic Philly Cheesesteak. Having never tried it or a Cheesesteak from Philadelphia, I can’t tell you whether that is true or not. 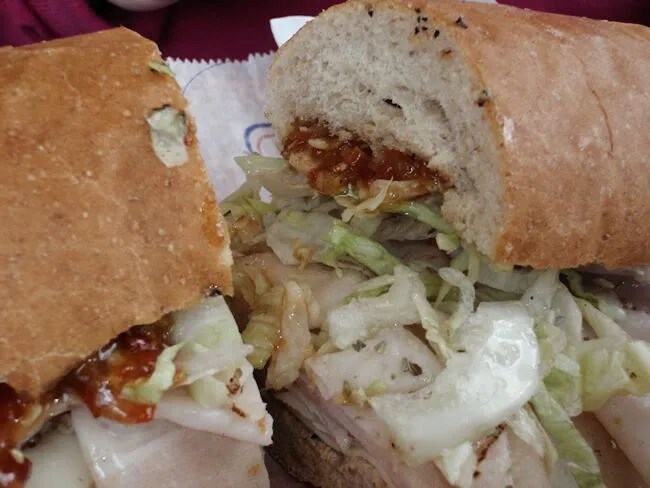 In addition to that Cheesesteak, they have a number of hot or cold deli subs, salads, and cold sandwiches. 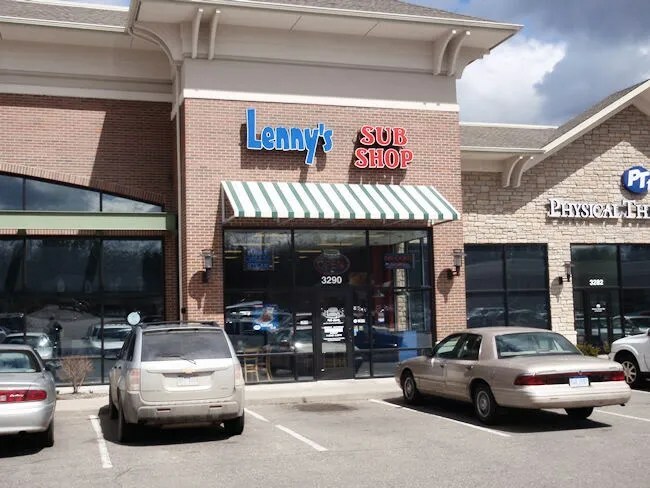 The Stadium Drive location of Lenny’s is the strip mall that also houses Gumby’s Pizza, Schafer’s Flower’s, and the Michigan Secretary of State office amongst others. The space is a brightly lit, long, narrow shop with seating near the front and the order counter and sub manufacturing line near the back. There’s also a kitchen beyond the cash register for cooking up the hot subs which are brought out to you once they are done. Having never been to Lenny’s before, we needed a few minutes to look over the menu that was hanging above the order area. I actually found the sandwich I wanted on an advertisement taped to the counter. J found one on the board under the cold sub options. The sandwich I chose was the French Dip. The sandwiches come in two sizes. Regular which is 7 1/2″ or Full which is 15″. I stuck with the regular which was more than enough and added on chips and a Coke. The chips I took where a bag of BBQ which are made just for the Lenny’s chain. J ordered the #4 cold sub which is Turkey. She also got chips and a drink opting for Sour Cream and Onion and Iced Tea. After placing our order and paying, we went to sit down not realizing that J would still have to pick veggies for the sub. I saw the guys behind the counter trying to figure out who ordered the turkey and told J she should probably go back up there, so she did and finished off her sandwich. The weird thing is you can’t actually see them making the sub. There are large steal pans with lids that block the view of what they’re doing and what is being held in those pans, so it doesn’t have the appearance of a Subway-esque shop. She went with the signature Hot Pepper Relish which was way to hot for her. It’s made with ground cherry peppers and vinegar. She took one bite and scraped most of it off. She said it was probably something I would like, but I was afraid to try it. She also got lettuce and oregano on the sandwich which she said was very good. Much better than the other sub options in the area. As for my French Dip, it came out a few minutes later and it looked delicious. 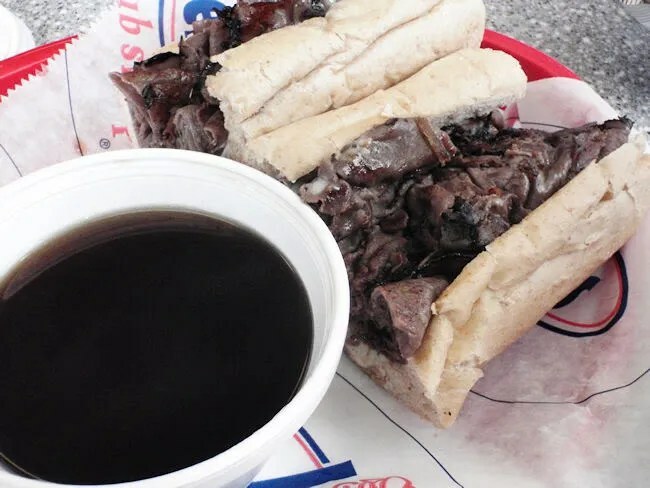 The sandwich was cut in to two smaller sections and served with a large cup of au jus. The meat was really tender and the bun actually held up to dipping in the au jus. It was surprisingly delicious. Our bill was a little over $17 and we both left stuffed which is always a good thing before going grocery shopping. Lenny’s was a definite surprise considering we didn’t know what to expect. For me, the thing that made the difference was the bread. It was a lot more like bakeshop bread than the dense stuff you get at a lot of of the chain sub shops. I can see a return trip to Lenny’s when we’re looking for that “lighter” (ie. not greasy) option. They never are….it’s just like places that advertise “Chicago-Style Pizza” It rarely is. Why don’t you have an RSS feed? It would help me keep up with your posts better! Didn’t know people still use RSS….You can follow me on Twitter…I always tweet when I post something new. Doesn’t everyone use Google Reader and such these days? I honestly don’t know anyone that still uses RSS…that’s why I never set one up for this blog. That doesn’t mean no one does, but you are the first person to ever ask about it. Yesterday (Sunday, September 30), I noticed all external signage had been removed, from both the building and both sides of the Stadium Shoppes pylon. Over several years, I have frequently noticed sign companies put up or take down signs on Sunday mornings (new yesterday in this plaza was a Verizon Wireless sign on the building, but not on the roadside pylon yet). It is also of note that yesterday was the last day of the month, so maybe their lease had ended. Saturday *may* have been their last day of business, or they have been closed longer and I didn’t notice. For sure, the signs were removed on Sunday. I didn’t bother to go up close, but it looked like the same furniture remained in the building. 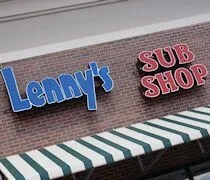 The Stadium Dr. location (Lenny’s #546) is still on Lenny’s website: http://www.lennys.com/locations/index.cfm/franid/248/ . The Portage location at 7089 S. Westnedge Ave. is no longer on the website, so they have apparently been closed longer. This means the closest Lenny’s to Kalamazoo is now 62 miles away in Lansing or Jackson. Tony’s nephew sold the sub shops to a new owner about 2 years ago and he moved back to Florida, or something. The Kalamazoo location open first and the Portage store opened later. The Kalamazoo location originally had some buzz because Tony Sirico was supposed to stop by for the grand opening. He never made it nor did he for any later occasions.